According to ancient Traditional Chinese Medicine (TCM), "Essence" is the most fundamental material substance, which makes up and maintains the body. This is the guideline of Essence of China Acupuncture and Herb Clinic in Indianapolis, Indiana. We strive to provide a warm atmosphere for our patients and treatments are designed to help patients strengthen their essence. Essence of China Acupuncture and Herb Clinic is an all-natural holistic clinic, which guides and reinforces patients to use their energy to "heal themselves". Patients will feel the spirit of Traditional Chinese Medicine. We have acupuncture clinics in Indianapolis and Muncie. Essence of China Acupuncture and Herb Clinic serves as a resident training site for Indiana University Medical Center at Indianapolis. NEW! We just opened our new office in Carmel, Indiana! Please click here to find out the location of our new office in Carmel, Indiana. NEW! Acupuncturist Lei Shaw in our clinic was interviewed for traditional chinese medical practices including acupuncture and Chinese herbal medicine by WFYI Indianapolis. Please click here to view the online video at WFYI's web site. NEW! 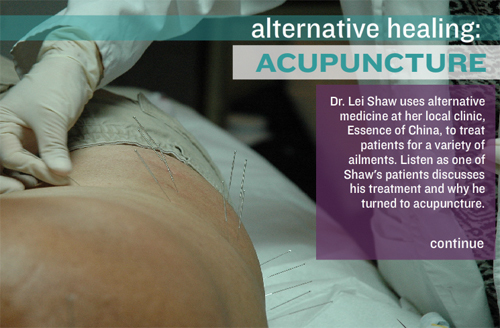 Acupuncturist Lei Shaw was interviewed for acupuncture, alternative medicine and alternative healing by the Ball Bearings Magazine reporter Eric Marty. Please click here to view the online video from Ball Bearings Magazine about acupuncture feacturing Lei Shaw and her acupucture clinic at Muncie. alternative medicine on Ball Bearings Magazine web site. NEW! Acupuncturist Lei Shaw in our clinic was interviewed by Angie's List about Acupuncture treatment of chronic pain. The featured story about pain management appeared in October 2011's issue of Angie's List, Vol. 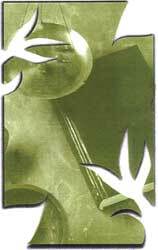 38, Issue 9. See a photo from Angie's List below showing Acupuncturist Lei Shaw from our Indianapolis acupuncture clinic performing acupuncture on a Angie's List member. NEW! Acupuncturist Lei Shaw in our clinic was interviewed by The Star Press reporter Oseye T. Boyd about Acupuncture, and the article "Going Under The Needle", written by Ms Boyd, appeared as the front-page headline story in Your Life section of The Star Press on November 9, 2010. Click here to read the article. NEW! We just opened our new office in Muncie, Indiana! Please click here to find out the location of our new office in Muncie. NEW! Acupuncturist Lei Shaw in our clinic was interviewed by Indianapolis Monthly reporter Ingrid Cummings about acupuncture, and the article "Stick it to Me", written by Ms.Cummings, appeared in the April of 2008's issue of Indianapolis Monthly. Click here to read the article. NEW! Acupuncturist Lei Shaw in our clinic was interviewed by The Indianapolis Star reporter Shari Rudavsky about pain-treatment with Acupuncture, and the article "Living with pain", written by Ms. Rudavsky, appeared as the front-page headline story in HealthyLiving section of The Indianapolis Star on November 28, 2006. Click here to read the article.